Beautifully hand crafted, Estate Millwork's Bahama Shutter collection will add elegance and functionality with loads of style to your home. Distinguished from other shutters by the fact that they are hinged at the top, rather than the sides, and usually have but one shutter per window, rather than two. Ideal for warm climates, Mediterranean and Caribbean style homes, Bahama shutters add shade to windows, porches and cabanas, as well as allowing for the shifting tropical breezes to pass to the interior of the house. Our Bahama Shutters are made from the top grades of lumber, and are designed with extra structural details that allow them to be used in even the largest scale. 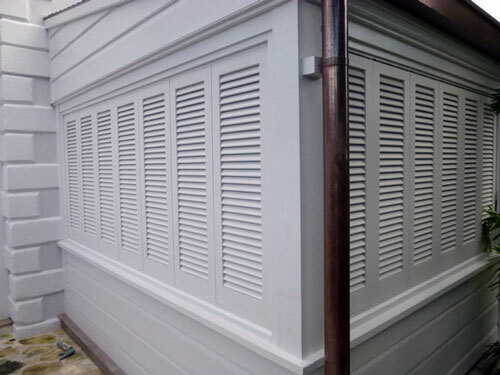 We have made Bahama Shutters that are in excess of 14 feet wide, with as many as 7 sub-stiles. Our standard thickness is a stout 1 5/16, and because these shutters are constructed with top grade hardwoods and true deep pocket mortise and tenon joinery, they are much stronger than most other brands. They can be fitted with louver blades of any size and shape, and for some applications, our customers equip them with operating louvers that allow the louvers to be fully open or fully closed, or anything in between. In order to maximize the durability of our exterior Bahama shutters, they are hand assembled by master craftsman using parts that are made in our state of the art plant. Our workers are skilled at the old world art of mortise and tenon joinery, and have a knack for assembling these elegant masterpieces in wood that sometimes can have more than 500 parts. Each shutter is joined with precision joinery, doweled and machine sanded. Then, depending upon the application, it will be hand sanded, primed, painted or stained. All of our Bahama Shutters are built to order, and we can work from sketches, photographs, CAD files, or existing shutters. Our goal is to make the perfect shutter for each application, and perfection is a combination of proportion, dimension, style and craftsmanship. We can work with you to meet your exacting requirements, and because of the high degree of automation in our plant, we are able to produce completely custom, furniture grade millwork at very competitive prices, often at prices lower than manufacturers using inferior materials and joinery. Our website is a good starting point for your project, you can browse the styles of Bahama shutters that we offer, and get quick pricing and detailed drawings on line. You can order directly on line, or feel free to contact us with special needs or project requirements.